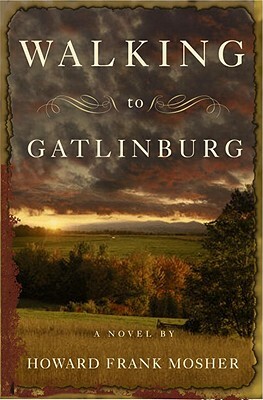 A stunning and lyrical Civil War thriller, Walking to Gatlinburg is a spellbinding story of survival, wilderness adventure, mystery, and love in the time of war. Morgan Kinneson is both hunter and hunted. The sharp-shooting 17-year-old from Kingdom County, Vermont, is determined to track down his brother Pilgrim, a doctor who has gone missing from the Union Army. But first Morgan must elude a group of murderous escaped convicts in pursuit of a mysterious stone that has fallen into his possession. It’s 1864, and the country is in the grip of the bloodiest war in American history. Meanwhile, the Kinneson family has been quietly conducting passengers on the Underground Railroad from Vermont to the Canadian border. One snowy afternoon Morgan leaves an elderly fugitive named Jesse Moses in a mountainside cabin for a few hours so that he can track a moose to feed his family. In his absence, Jesse is murdered, and thus begins Morgan’s unforgettable trek south through an apocalyptic landscape of war and mayhem. Along the way, Morgan encounters a fantastical array of characters, including a weeping elephant, a pacifist gunsmith, a woman who lives in a tree, a blind cobbler, and a beautiful and intriguing slave girl named Slidell who is the key to unlocking the mystery of the secret stone. At the same time, he wrestles with the choices that will ultimately define him – how to reconcile the laws of nature with religious faith, how to temper justice with mercy. Magical and wonderfully strange, Walking to Gatlinburg is both a thriller of the highest order and a heartbreaking odyssey into the heart of American darkness. HOWARD FRANK MOSHER is the author of ten books. His novel "A Stranger in the Kingdom" won the New England Book Award for Fiction and was made into a movie, as were his novels "Disappearance" and "Where the Rivers Flow North." A recipient of the Literature Award from the American Academy and Institute of Arts and Letters, Mosher lives in Vermont. "Mosher is a rare storyteller, able to both instruct and entertain, and he brings all his talents to this unforgettable and unique novel." "A Civil War odyssey in the tradition of Charles Frazier’s Cold Mountain and Robert Olmstead’s Coal Black Horse, Mosher’s latest, about a Vermont teenager’s harrowing journey south to find his missing-in-action brother, is old-fashioned in the best sense of the word....The story of Morgan’s rite-of-passage through an American arcadia despoiled by war and slavery is an engrossing tale with mass appeal. "We are in the hands of a skilled storyteller, and every word matters. A captivating story, and one that cries for a sequel." "[A] haunting and hallucinatory novel....Historical realism this isn’t but it is a violent, often puzzling picaresque with an invigorating take on the Underground Railroad and an unsettling vision of an America despoiled by the War between the States."